The Grand Theatre in Leeds is a fascinating building with a whole range of nooks and crannies that are not first evident when visiting. Opera North revealed one of the buildings hidden gems when it restored the space now known as the Howard Assembly Room, giving the building a lovely smaller performance space. Now further developments and improvements are afoot, as Opera North has announced ambitious new plans. The Howard Assembly Room's profile will be raised by creating a new dedicated entrance and box office, with a new restaurant and bar replacing a row of vacant shop units directly beneath the venue on New Briggate, which will be a big improvement. 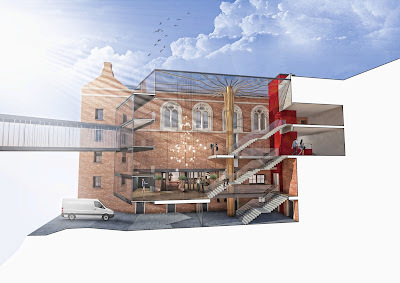 A new atrium space will link the restaurant and bar space with stairs and lift access directly to the Howard Assembly Room, as well as provide improved front of house facilities for audiences at the venue. There will also be an extended artistic programming at the venue, and it celebrates its 10th anniversary in January 2019. Further development to the Opera North administrative buildings adjacent to the theatre will connect the primary rehearsal spaces, administrative offices and costume department with new music practice rooms and a chorus and orchestra rehearsal room. And there will also be a new Education Centre to further support Opera North's significant education work (which has a turnover of over £1 million, invested in the young people of the area). Interested parties are invited to attend a public consultation event on the capital redevelopment project, which will be held at the Howard Assembly Room on Thursday 26 April, from 5.30pm – 7.30pm.